Members can purchase the output of South Central Power’s OurSolar array. This program is now available on a first-come, first serve basis, so reserve your panels today! See below to determine how many solar panels you may need. Use this form to reserve panels for South Central Power's OurSolar array. How many panels should you reserve? First, consult the Electricity Usage chart on your bill. Find find the lowest monthly kWh over the past year. 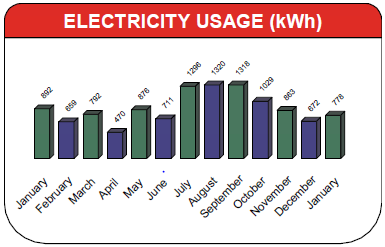 In this example, the lowest month is April with 470 kWh. Next, divide that number by 35 kWh, which is the average amount of energy expected to be produced by each panel each month. The resulting number should be the maximum panels you should reserve. In this example, that would be 470 divided by 35 = 13 panels. Have questions? Give us a call at 800-282-5064. We’d be happy to help you out.